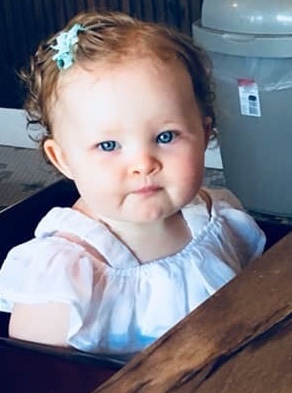 Lillyana Ann Bailey, 18 months, of French Lick, passed away January 12, 2019 at IU Health Paoli Hospital. She was born June 16, 2017 in Lewiston, ID to parents. Corey & Tamara (Longest) Bailey and they survive. She is also survived by brother- Ezechiel Bailey of French Lick; half-brothers- Alexander Viernes & Leonardo Viernes both of Spokane Valley, WA; maternal grandparents- Robert & Cindy Longest of Paoli; Melissa Lively of Mitchell; paternal grandparents- Gregg Bailey of Rathdrum, ID, Sherri King of Athol, ID & Pam Hayman of British Colombia & maternal great-grandparents- Lynn Longest of Mitchell & Rita Gilstrap of Port Orange, FL. She is preceded in death by: paternal great-grandparents- Elaine Bailey & Deana Harrington & maternal great-grandparents- Robert Longest Sr., Maribel Longest & Rodney Gilstrap. Cremation was chosen. A Celebration of Life service will be Saturday February 2, 2019 at 2 p.m. at the Gateway Ministries Church in Paoli, Indiana.